Bhavana Tiple and Prof. Achamma Thomas. "Finding Similarity Between Ragas Using K-Means Clustering." Journal 4 Research 3.5 (2017): 1-3. Sameer S Kulkarni, Rakesh Kulkarni, Rajendra Sanal and Sachin Patil. "High Performance Sugarcane Plantation Equipment." Journal 4 Research 3.5 (2017): 4-6. Rakesh R. Savant and Preeti P. Bhatt. "A Review on Segmentation Problems on Gujarati Handwritten Text Document." Journal 4 Research 3.5 (2017): 7-11. S. Poorani, Dr. P. Balasubramanie and N. Sasipriyaa. "A Study on Hierarchical Clustering for Identifying Asthma Endotypes." Journal 4 Research 3.5 (2017): 12-14. M Nirmal and M Chattopadhyay. "Grid Connected Rooftop Solar Power Generation in India - A Review." Journal 4 Research 3.5 (2017): 15-19. N. D Suwarnakar, Dr. S. N Nemade, Dr. P. V Thorat and Dr. S. G Gaikwad. "Synthesis and Characterization of Sodium Tripolyphosphate." 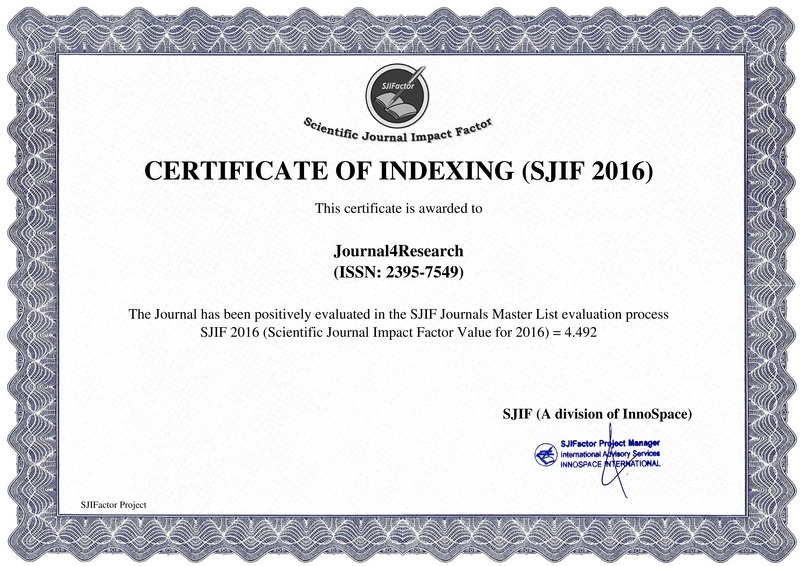 Journal 4 Research 3.5 (2017): 20-23.